We're new to the RV world. Have a Class A unit, and am having trouble finding a list of vehicles which may be pulled behind our coach. Am looking for 4WD, so need info that will accommodate driveline release from the transmission. Frustrated with trying to find anything on the internet. Any words of wisdom from experienced parties will great fully be appreciated. Still looking for vehicles that can be towed all wheels down, 2006-2010 Preferably Ford. http://www.motorhome.com/download-dinghy-guides/... does not have this info...pls help. 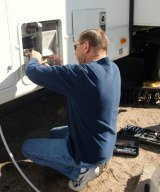 Motorhome Magazine has a lot of information on Dingy towing as well as many other RV tips, etc. Here is the link to their dingy towing guide which covers what vehicles can be flat towed. Good luck and welcome to the RV world. It sure is a different life style and I hope you enjoy it as much as we do. Towing a vehicle on a dolly backwards? My wife and I purchased a 2013 Grand Cherokee Jeep, 2wd. We are now wanting to purchase a Motorhome and tow this vehicle. We called the Jeep hotline and was told since it was not a 4wd vehicle the only way we could tow it was to have the back wheels off the ground using a dolly and pull it backwards. We have been traveling a while and I do not believe we have seen anyone pulling a vehicle backwards. Can anyone give us some info about this? What would be involved with this. Thanks in advance. I've had input that my Honda Odyssey can dinghy tow behind my 40' motorhome, and I am having Camping World install the proper towing kit on the Honda. Anyone out there already towing a Honda Odyssey? How is it working out? Any advice? We've towed ou 2000 Odyssey over 20,000 miles with zero problems. I chose the Odyssey specifically because it would fit parents & four kids + groceries comfortably, be easy for my wife to drive and no lube pumps or driveshaft disconnects needed. Kids are getting bigger so we're now pulling a Toyota Sunrader that doubles as the boys' dorm. The Odyssey is for sale, all set up for towing with baseplate, towbar and light wiring included. Email abwegeurink(at)gmailDOTcom if interested. I have a Honda CRV [same basic drive line] When towing be sure to follow the manufacturers instructions on preparing the transmission for tow. I never pulled the recommended fuse because you have to be a contortionist to get to the fuses. I've never had my battery go dead, but I do occasionally start the engine and run through the gears when stopped to stretch our legs or take in a view. This vehicle has been a dream to tow over many thousands of miles. Relax have fun & enjoy! I am trying to find out if anyone knows of RVers who are pulling a Prius behind their coach, and if so how. We are thinking about going fulltime RVing. We want to have a car to get around in when parked. Our RAV4 is paid for, but not recommended for towing except on a trailer. A trailer is another piece of equipment that has to be stored when parked. Any suggestions?